Growing up I had my share of experience being bully in school. Back then they either took my lunch money, made do chores for them or, worst case, they would beat me up. At times, I would try to avoid the bully, particularly those older than me, just to avoid the hassle. It made my world a lot smaller because I was not able to venture to places that they would frequent. My upbringing was a little different in the sense that my parents often thought that I instigated the fight and that’s why I ended up getting beat up. Therefore I tended to keep the issue to myself and never tell anyone unless I came home with a ripped-up uniform or all the buttons gone; that’s when I had lots of explaining to do. And as I grew up and got taller, the incidents of bullying trailed off. Especially in situations when I fought back and defended myself. On Monday, my seven year old came home from school and told my wife that a boy from a higher grade yelled, “Go away ugly Asian girl.” My wife asked her what she did in that situation and she indicated that she just walked away. She was shocked by what happened to her. I understand that sooner or later that she will experience bullying. What upsets me is that the bullying has a racial undertone. The incident kept me up at night wondering why it happened. On Tuesday night, I wrote a note to her teachers and expressed my concern regarding the incident. The principal acted swiftly and the matter was addressed accordingly. What’s my point by telling this story? The point of my story is that we need to constantly communicate with our children. It is important that they feel safe to tell us what’s going on while they’re away from home. As parents, we need to keep an open mind and resist the urge to jump to conclusions. Our children do not want to be judged, but rather want to be heard. With the advancement of technology, bullying has manifested itself in many forms, such as sending explicit pictures to all their friends that would cause embarrassment to the subject. Unfortunately, bullies do not usually think of the repercussions of their actions and victims are left to fend for themselves. I would suggest that you establish an open channel of communication to your children. It’s best that you know what’s going on; this way you can help them. Let your children know that you’re there for them. Let them know that they have the choice to walk away and that the choice is always theirs. I was saddened to hear about the bullying – and especially saddened because of the racial component. There is no place for that in school, or in life. I’m glad your daughter was able to speak about it and it was addressed. Too many children don’t take that step and carry a huge burden that should not be a part of childhood. One thing we should remember and teach our children. For there to be power in a relationship takes two people. I am so glad your daughter shares an open and trusting relationship with your wife and you. I agree, kids dont normally like to talk about incidents like this fearing being held responsible for inciting/triggering the situation. I also have great respect for the school administration for having taken some action…especially when all you read in the news is that they wash their hands off such cases. 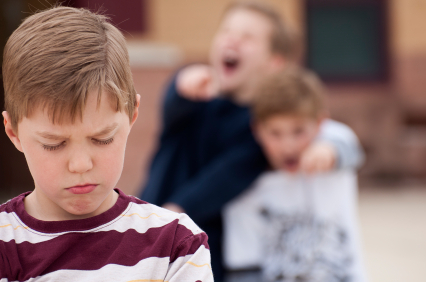 I am not a big fan of little kids being bullies – it is an indication of a larger problem…of bad parenting…of an insecure and troubled adult in the making. The one valuable takeaway for me as a new parent is to not judge, but to hear kids out. I’m going to remember this for the rest of my life as a parent, friend and partner.